St. Paul was determined to revisit the Galatian churches, but when Barnabas suggested that they take John Mark again, the two apostles parted company. Silas joined St. Paul, and they strengthened the churches in Syria and Cilicia on their way to Derbe and Lystra. Here St. Paul had a providential meeting with a young believer named Timothy. Recommended by the church there and in Iconium, Timothy was circumcised and then joined the apostles (16:1-3). After the three visited the church in Pisidian Antioch, the Holy Spirit forbade them to visit Ephesus in the province of Asia. Their subsequent route through central Turkey has occasioned much debate by scholars. They certainly turned northward following the Roman road, and then arrived at the important junction at Dorylaeum. 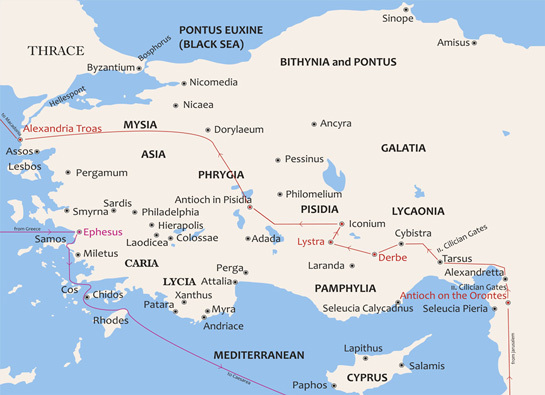 Here they turned northwest toward the important cities of Nicea and Nicomedia in the province of Bithynia. But again the Holy Spirit forbade them from entering Bithynia. So they passed by Mysia and arrived at the important port city of Alexandria Troas (16:6-8), near the city of Troy made famous in Homer's Iliad. Here St. Paul received a vision of a Macedonian man; at last the Holy Spirit provided clear direction. Acts 16:10-17 begins the first of three "we" sections in the book (cf. 20:5-21:18; 27:1-28:16). These suggest that Luke was himself a companion and eyewitness to portions of the journeys he described. After a successful time of ministry in the provinces of Macedonia and Achaia, St. Paul departed Corinth by ship. He stopped briefly in Ephesus on his return to Jerusalem and Antioch, vowing to return if it was God's will (18:19-21). In his absence he left Priscilla and Aquila. This journey occurred about 50-52 with one and a half year based in Corinth.